The 2015 Parapan Am Games Are ON! The 2015 Parapan Am Games kicked off in Toronto Friday evening with a heartwarming rendition of 'O Canada' by Gabrielle Goulet. The Mississaugas of the New Credit First Nation, the Huron-Wendat First Nation, the Six Nations of the Grand River and the Métis Nation of Ontario then took stage with a performance about beginnings of Canada. Flag-bearer Marco Dispaltro led Team Canada into the parade of nations at York University's Athletics Stadium. Canada has 216 athletes competing in the Games between Aug. 7-15. Canadians in the audience waved their flags, proudly welcoming the athletes. 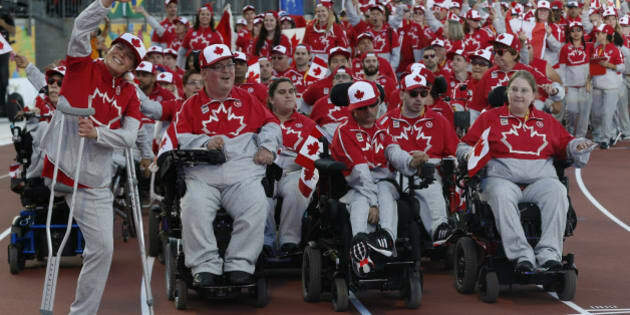 There are more than 1,600 athletes from 28 countries vying for victory at the games, making it the largest Parapan Am Games in history. Pan Am CEO Saäd Rafi greeted the roaring crowd, with words of encouragement to the athletes. “When we see these amazing athletes compete, we see spirit and strength that shows us anything is possible," he said. Governor General David Johnston was present and had the honour of declaring the Parapan Am Games officially open! The evening continued with a breathtaking display of traditional dances from countries around the world, such as Filipino fan dancing and the Chinese lion dance. While performances included dancers with different sets of abilities, there was some criticism that they weren't diverse enough. The Parapan Am Games' torch was brought in by activist and athlete Rick Hansen and CBC's Rick Mercer. The torch was then passed on to Chantal Petitclerc, who lit the Paralympic cauldron. Petitclerc is a five-time Paralympian, and Canada's most decorated Paralympic athlete. The ceremony wrapped up with crowds dancing to a musical performance by Francesco Yates. And, of course, there was a dazzling fireworks display. All the best to the athletes competing!